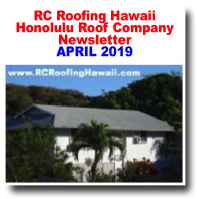 4/15/2019 - Why Perform a Roof Inspection? 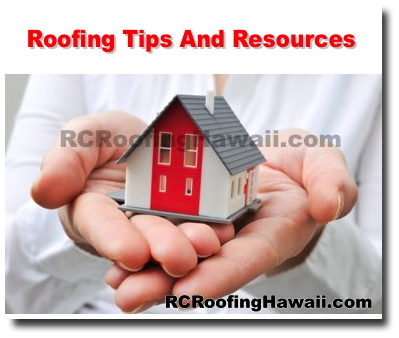 Hawaii's strong winds and hurricanes can cause significant damage to your roof. Even if you don't see any damage on the outset, damage can build over time. Here are some of the common roofing types that we work with. Don't forget to call us for a free roof inspection. 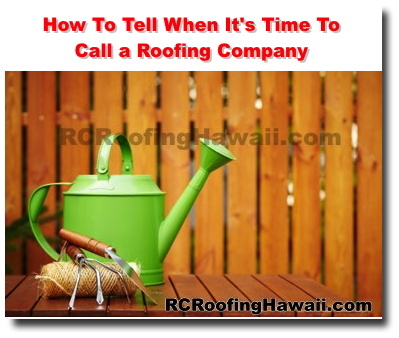 4/1/2019 - When Is It Time To Considering Repairing or Replacing Your Roof? The prospect of having your roof repaired or replaced may seem daunting, but we are here to help! Your roof is the most important part of your homes structure. It is the only thing keeping your home and everything inside safe from the elements, so it needs to be in excellent condition. Renovating or replacing your roof is a major undertaking. Finding the right roofing contractor for the job is an important first step. With so many companies out there, which one should you work with? Here are some questions you should ask potential roofing contractors. 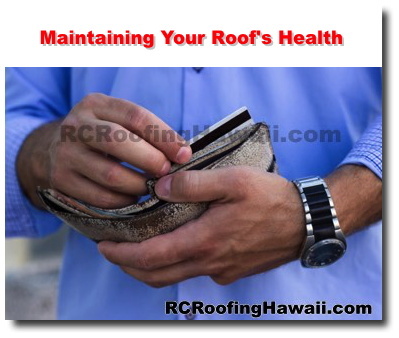 Even if we usually don't experience in Hawaii, it's best to keep your roof safe during our winter months. Here are some tips on how to winterize your roof. If you notice that your roof has some damage and are attempting to make repairs, here are some tips to help you stay safe. Your home's roof not only serves to insulate your home but it also the first layer of protection against the elements. Over time your roof will begin to show signs of wear and damage and may need professional assistance for repair or replacement. To avoid the risk of injuries and accidents while working on your roof, it's important to recognize the hazards and find ways (and protection devices) to prevent them. Weather changes, strong winds and rain can cause significant damage your roof. To avoid costly repairs and replacements, here are some steps you can take to protect your roof all year round. Working on your roof may be a dangerous endeavor if you are not careful. Slips and falls, while avoidable are common accidents that can occur. If you have roof damage and need to make repairs, here are some safety reminders to help keep you safe. From multi-story apartment building to residential homes, metal roofs can offer some benefits to homeowners and building owners alike. If you'e planning to do some roofing DIY, investing in roof brackets and a good roofing harness system may be helpful. These tools can help keep you safe while working on your roof. There is no question that a hurricane can cause significant damage to properties. With winds rotating at least 73 mph, hurricanes are usually accompanied by thunder and lighting and rain. While many people use it interchangeably, roof shingles and shakes are not the same. Strong winds can also cause significant damage to your roof. The corners and perimeters of your roof are the most susceptible since they get more wind stress while there may be less on the center of your roof. Trees can help enhance your home's landscape but it may also be a significant threat during a strong storm. If a tree falls on your home during a storm or hurricane, here are some possible action you can take. When a storm hits, it is always a good idea to inspect your roof afterward. Even if the storm didn't produce a lot of rain, wind can also cause significant damage, including tearing shingles or tree branches hitting your roof. Applying sealant on your roof can help prevent leaks and keep water out of your home. It is a much simpler process on the roof compared to installing shingles or metal roofing. It can also go a long way toward keeping your home leak-free. There are several steps you can take to maintain the life of your roof. If you notice your shingles looking old and needing more routine maintenance, it may be time to consider replacing them. Here are some essential tools that we recommend using when doing roof shingle repair or removal. In any do it yourself job, safety is of utmost importance. It is even more important when you're working on your roof. Slips and falls are always a concern but it can be more serous when you have a steep roof. Her are some tips on how to stay safe. Whether you're doing a roof repair yourself or hiring a roofing company, it is important to familiarize yourself with some basic roofing terms. Your roof, after all, is an important component of your home so it's good to know how some terms. Your ladder an essential tool when doing any DIY repairs to your roof. So it's important to remember these safety tips before attempting and roof inspection or repair. A leaky roof can provide a lot of damage to your home. Here are some possible causes of roof leaks. Slate is one of the oldest roofing materials around. It can be seen on colonial, European or French style homes. It is very durable and is wind and fire resistant and is made from natural slate rock thus giving your roof a distinct elegance and look. Depending on your style and preference, there are many roofing materials that you can choose from for your roof. From slate, wood to asphalt and sheet metal, your options are abundant. Here are just some of the types of materials below. With over 50 years of combined roofing experience, we have gained some valuable roofing knowledge over the years. If you're considering doing some DIY roof repairs, here are some helpful tip. Installing roof shingles is an important step in protecting your home from wind and rain damage. If you'd like to do it yourself, safety should always be a top priority as well as using proper protective equipment. Here are more helpful tips on how to install your roof's shingles. 9/17/2018 - Should You Repair or Replace Your Roof? When inspecting your roof for damage, these signs could help you determine if it can be repaired it's time to replace it. Your roof is an important part of your home that shouldn't be taken for granted. Any significant damage can create higher energy and repair costs. So here are some tips on how to tell if it's time to call the experts. Falls from roofs account for more than one-thirds of fall related deaths in residential construction. So before attempting to do any home repairs on your roof, here are some helpful safety reminders to consider. When doing DIY work on your roof, here are some things to keep in mind when using your tools. Before attempting any DIY roof work on your home, be sure to read these safety tips to help keep you and your family safe. Most roofs are designed to resist typical winds, but constant strong winds and rain can take a toll on your roof through the years. It's always a good idea to have your roof inspected by professional roofers but here are some things you can do to spot any roof damage. Hawaii's strong high winds can cause damage to your roof. To help protect your home, here are some helpful tips to help you prepare. 8/4/2018 - When Should You Paint A Metal Roof? Many metal roofs today are made from top quality paint systems that can easily last over 10 years, maintenance-free. If your roof is over 10 years, it would be good to do a visual inspection to assess any potential damage. Decra Roofing Systems has over 50 years of experience with stone coated steel roofs. Compared to traditional tile products, Decra Tile Roofs are made of lightweight components of stone coated steel. Composition or composite shingles are gaining popularity among homeowners. It sometimes looks like asphalt shingles but is actually made of composite plastics and fiberglass along with a variant of materials such as asphalt, slate, wood, tar paper and laminate. Asphalt Shingles is one of the most widely used roofing material in North America. They come in a wide array of styles, colors and textures and are very affordable. It is also lightweight and has a long life expectancy. Asbestos is a fibrous material that can cause mesothelioma and lung cancer. Get some tips. Rain gutters perform a critical task for your home. Gutters route the water runoff from your roof whenever it rains, draining it away from your house, protecting the home's siding, windows and doors from water damage. Roofing systems generally fall into these two types - steep slope or low slope. Get the details. Mold and mildew growth on your roof are both unsightly and harmful to your health. Here are some ways to prevent mold on your roof. Wood shakes and wood shingles are commonly manufactured from western red cedar, cypress, pine and redwood trees. Before you spend a lot of money on roof repairs, here are some ways where you can prevent water damage on our roof. Whether you have a brand new roof or an aging one, here are some things you can do the help make it last for as long as possible. Water damage and leaks can cause serious problems for your roof. Leaks can develop over time and are caused by a variety of reasons such as wind damage, improper roof installation or lack of maintenance. The best way to prevent roof leaks is to detect them early. 5/12/2018 - How Often Should You Paint Your Home's Exterior? Repainting your home's exterior gives your home a nice facelift as well as an opportunity to check for any damage before you paint. To avoid costly repairs, make sure you inspect your roof regularly (at least twice a year) and after any strong winds or storm. Even if you don't see any roof obvious damage after a storm, damage can build over time. Here are some thing to look out for when doing an inspection. 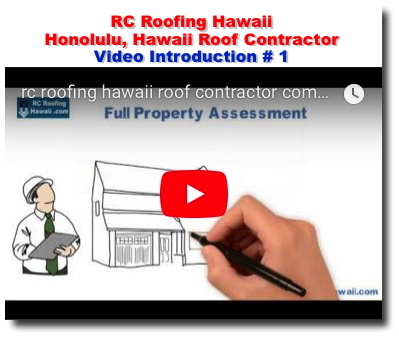 4/21/2018 - Why Perform a Roof Inspection? 4/7/2018 - When Is It Time To Considering Repairing or Replacing Your Roof? 9/23/2017 - Should You Repair or Replace Your Roof? 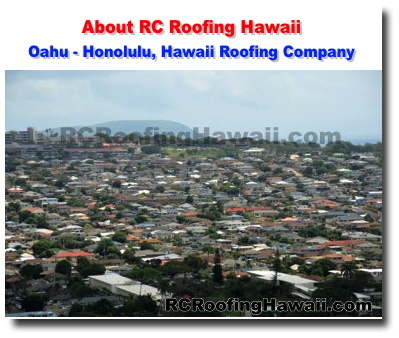 R&C Roofing Hawaii is locally owned with over 50 years of combined roofing experience including roofing installation, replacement, preventive maintenance and emergency repairs. 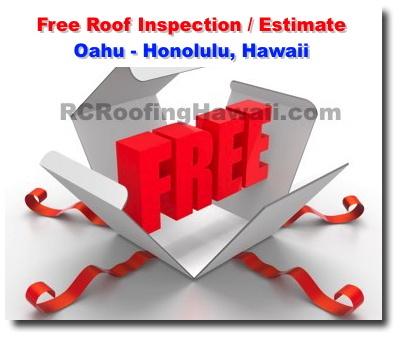 Watch video and learn about our free roof inspection. 7/25/2017 - R&C Roofing Contractors Is Now CertainTeed SureStart Certified! 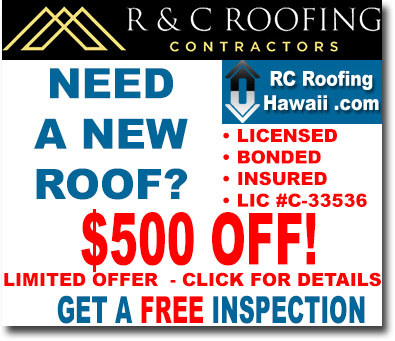 Premiere Oahu roofing contractor company with over 50 years of combined roofing experince. Serving Oahu - Honolulu, Hawaii.